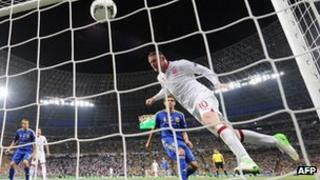 UK government ministers will not attend England's quarter-final Euro 2012 match against Italy in Kiev on Sunday. Downing Street said there were still concerns about the rule of law and selective justice in Ukraine. However, if England make it to the semi-finals, which are going to be held in Poland, ministers will attend. Downing Street say no decision has been made about the final, which is being held in Ukraine. A spokeswoman said: "Let's just see how we go on Sunday." The UK is particularly concerned at what it terms the "selective justice" meted out to jailed opposition leader Yulia Tymoshenko. Ms Tymoshenko played a key role in the Orange Revolution in 2004 and says her imprisonment, for alleged corruption, is an act of political revenge by Ukraine's President Viktor Yanukovych. The authorities have rejected Ms Tymoshenko's allegations. She was jailed for seven years in October for abuse of power during her time as prime minister. Ukraine's ambassador to the UK said "sport and politics do not mix" and concerns must be raised in other ways. Before the tournament started, the Foreign Office said no officials would attend the three group games and it was keeping attendance at later stages of the tournament "under review in the light of ministers' busy schedules ahead of the Olympics and widespread concerns about selective justice and the rule of law in Ukraine". Asked about the boycott at the time, Foreign Secretary William Hague said Ukraine had "serious problems" and the UK government did not want its backing for the England team to be interpreted as "giving political support to some things which have been happening in Ukraine which we don't agree with". Ukrainian foreign ministry spokesman Oleg Voloshin said Britain's concerns were understood, but the boycott would only damage football and would not affect Ms Tymoshenko's case. England reached the quarter-final stage after defeating Ukraine on Tuesday. For Labour, Douglas Alexander, shadow foreign secretary, said: "The Government's failure to clearly set out what the official guidelines are for ministers attending football matches in the Ukraine is simply inexplicable. "They should immediately put an end to the damaging uncertainty by ruling out any official ministerial attendance at all future England matches in the Ukraine at whatever stage of the tournament."